THP is pleased and excited to announce a VERY special contest today. Partnering up with TaylorMade Golf for a chance to have one lucky winner on THP own a brand new set of xFT wedges (52, 56, 60). Exchange the Face and get that control back with Fresh Z Grooves for exceptional backspin. Exchangeable Face Technology (xFT) maintains fresh high-performance grooves and wedge performance with a rough surface to promote maximum backspin and control. A four-step process produces a perfectly flat face and perfectly formed high-performance grooves, ensuring the face fits precisely into the milled pocket while promoting soft feel. This club is designed to promote spin and is beautiful, playable and durable. The lucky winner will get a full 3 wedge set (52, 56, 60) of brand new TaylorMade Golf xFT wedges. Clean grooves mean more performance, spin, and control! Many of our readers are familiar with our “Scavenger Hunt” contests, but those that are not, it is really quite easy. We will ask 3 questions and each one of them can be answered by browsing through the TaylorMade Golf website. Each entry that is submitted with the correct answers, will be entered into a random drawing to pick out the winners of this fabulous contest. Answers to questions (your entry) must be emailed to contests@thehackersparadise.com. The deadline of this contest Friday July 30th, 2010 at 11:59pm EST. All entries must be received by then to be considered. You must be a registered forum member with at least 10 posts to submit your entry and at least 5 posts in the last 30 days. 1. According to the performance chart, as grooves wear, spin rate goes down and _________ goes up? 2. 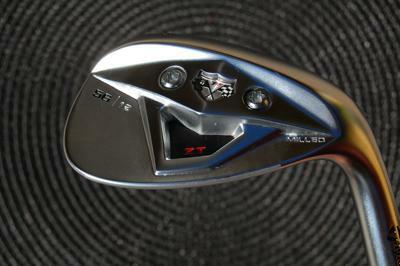 TaylorMade lists four reasons for their precision milling of the xFT wedge. What are they? 3. How will playing clean and new grooves each year make you a better player? No wrong answer here. You can find the answers to each one of these questions at the TaylorMade Golf website HERE. At Doral GolferGal sat down with Kenny Perry and discussed his switch to the TaylorMade xFT wedge and why he is enjoying it so much. Good luck to everybody and we hope that every person here has a blast with this contest and learns a little bit about why xFT technology and clean grooves in general can help most golfers. We want to thank TaylorMade Golf for these amazing prizes. awesome contest! a big thank you to Taylormade and THP for putting this one on. this would truly be an amazing win. Agreed tcalloway, contests like these are pretty amazing! Photos are up in contest winners thread for everyone!